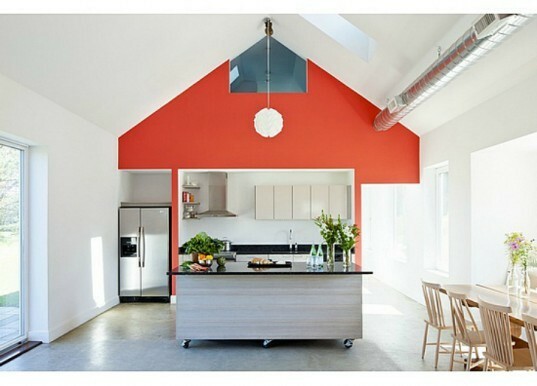 This charming and compact retreat in Little Compton, Rhode Island is actually a passive home that only needs 1/10th of the energy a conventional home requires for heating. The two-bedroom home enjoys a super-tight envelope with high performance insulation, passive solar heating and heat recovery ventilation. 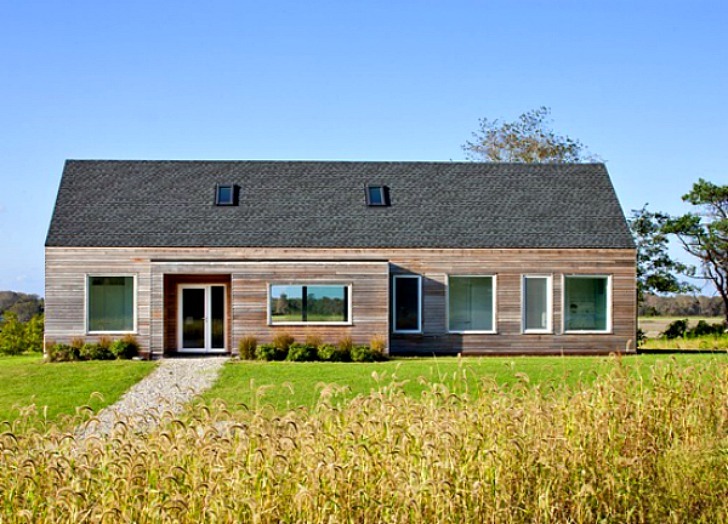 Designed by Boston-based ZeroEnergy Design, the Little Compton Retreat is seeking Passivhaus certification, and is the perfect spot for family gatherings. Little Compton Retreat is designed as a simple, gable-roofed structure with two bedrooms, with an open floor living, dining and kitchen area in the center. A bedroom is located on either side of the home, and a loft area above the master bedroom provides space for the children to play up and out of their parents way. Family and friends often visit the vacation home, so the public area is open, large and flexible. At only 1,200 sq ft, the home manages to pack in a lot of space and storage despite its modest footprint. In order to minimize energy use to just 1/10th of a conventional home, ZED designed the home to take advantage of the sun for natural daylighting and heating. A generous amount of south-facing windows maximize solar heat gain in the winter, and the polished concrete floor absorbs the heat and re-radiates it into the space. North-facing sliding doors open the living room up to the outdoors to extend living space. The home features a high performance envelop with R-40 walls, R-40 slab, R-70 roof, and exceptional air sealing, which minimizes leaks. A heat recovery ventilator maximizes the heat the home produces and low VOC materials and finishes maintain indoor air quality. The home was designed to Passivehaus standards and hopes to receive certification in the near future. Little Compton Retreat is a simple, gable roofed structure with two bedrooms, an an open floor living, dining and kitchen area in the center. A bedroom is located on either side of the home and a loft area above the master bedroom provides space for the children to play up and out of their parents way. Family and friends often visit the vacation home, so the public area is open, large and flexible. The bright and open living room features high ceilings. The nook dining table seats the immediate family as well as extended family comfortably. At only 1,200 sq ft, the home manages to pack in a lot of space and storage despite its modest footprint. In order to minimize energy use down to 1/10th of a conventional home, ZED designed the home to take advantage of the sun for natural daylighting and heating. A generous amount of south-facing windows maximize solar heat gain in the winter and the polished concrete floor absorbs the heat and re-radiates it into the space. North-facing sliding doors open the living room up to the outdoors to extend living space. The home features a high performance envelop with R-40 walls, R-40 slab, R-70 roof, and exceptional air sealing, which minimizes leaks. A heat recovery ventilator maximizes the heat the home produces and low VOC materials and finishes maintain indoor air quality. The home was designed to Passive House standards and hopes to receive certification in the near future. Floor plan of the Little Compton Retreat.